Our new Mini Maker Faire poster is here! Comments Off on Our new Mini Maker Faire poster is here! 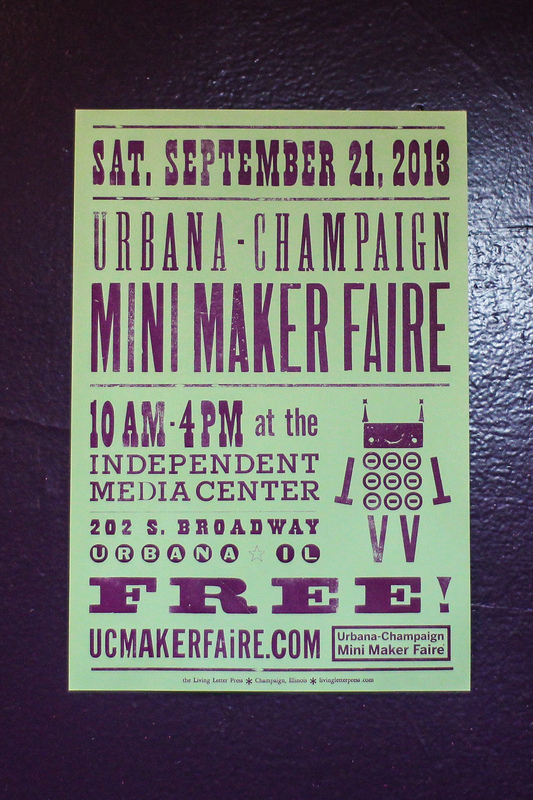 The Living Letter Press made the Urbana Champaign Mini Maker Faire a poster again this year, and it’s beautiful! We love their work. And it just happens to match the purple wall at Makerspace Urbana. Look for it around town soon. If you need your own unique cards/invitations/posters/whatever definitely keep them in mind. 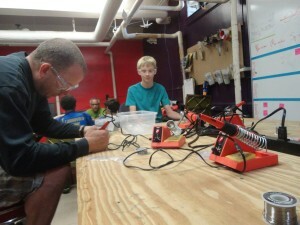 They also run awesome workshops! Is it a bird? Is it a plane? It’s neither. 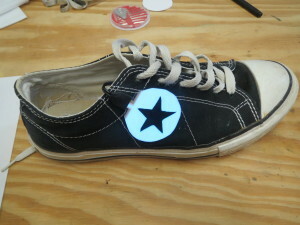 But everyone that attended our Glowing Chuck Taylors workshop (as part of our Summer Make-a-tion series) certainly gained the power of being awesome! Check out the finished product. I dare you to say that doesn’t look cool. Check out more pictures on our Facebook page here. 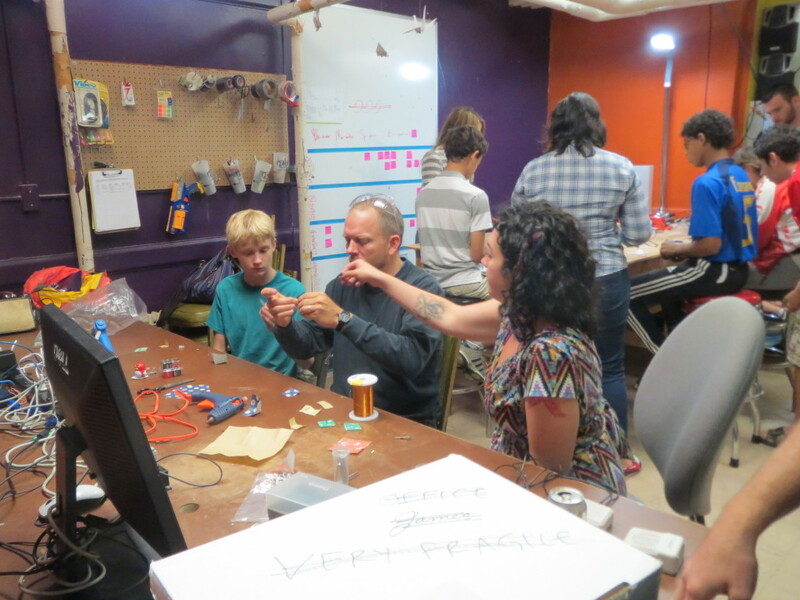 We continued our Summer Make-a-tion series in true Discotech style by setting up several workshop stations which allowed everyone to move around as they liked. 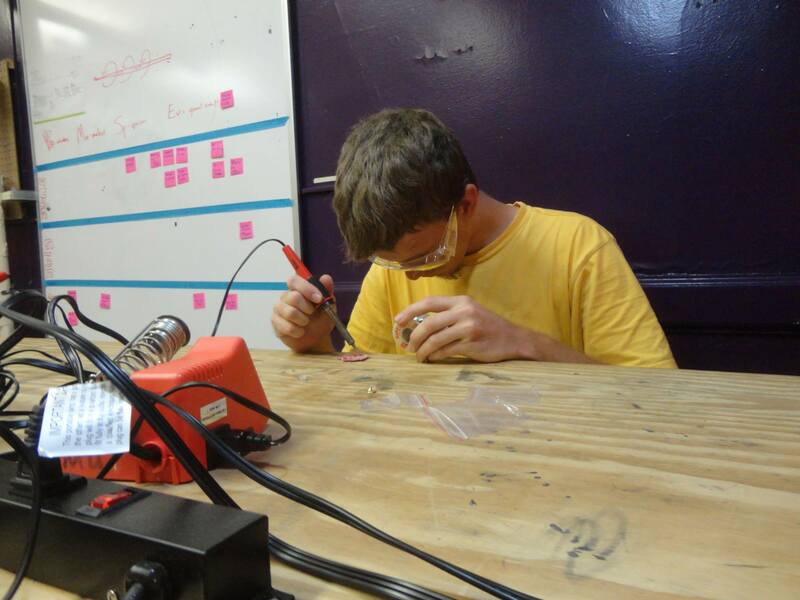 We had our classic soldering workshop which teaches the basics behind using a soldering iron. 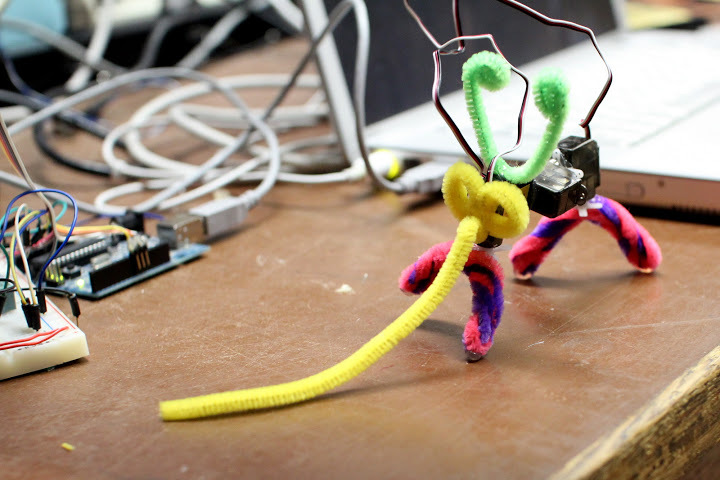 The project revolved around putting together a small robot pin by attaching its eyes (LEDs) and a holder for a small coin-cell battery to the body. I’m not going to say people learned a lot, but I think people learned a lot. And if you think this isn’t the most fun you can have in 2 hours on a Saturday, we also taught people how speakers work by making our own mini versions using origami paper, speaker wire, and a magnet. We discovered this jem of a workshop at this year’s Allied Media Conference in Detroit. Props to Mt Elliott Makerspace for being awesome. Check out the rest of the photos on our Facebook page. The artists will keep 50% of the proceeds, and the remaining 50% […] will be donated to The Bike Project of Urbana-Champaign to help establish a cooperative bicycle shop in North Champaign. Of course Makerspace Urbana had to enter. 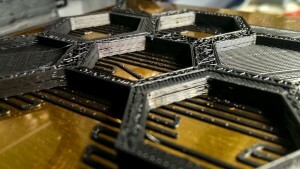 A quick video of our submission is below: a mix of cross stitching, electronics, and touch sensitive thread. And it’s for sale. Half the proceeds go toward the Bike Project and the other half will be donated to Makerspace Urbana! SO BUY OUR ART! It’s for two great causes. Come check it out in action at Indi Go Gallery (9 E University Ave in Downtown Champaign). Grand Opening is Friday, August 16th at 6pm. The show will run until August 25th. 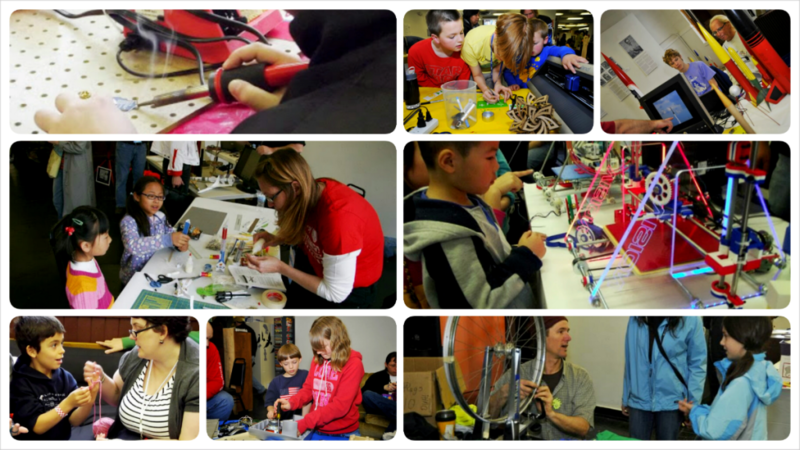 Here’s to the Third Annual Urbana-Champaign Mini Maker Faire! Comments Off on Here’s to the Third Annual Urbana-Champaign Mini Maker Faire! Makerspace Urbana is proud to announce that we will be hosting the third annual Urbana-Champaign Mini Maker Faire located at the Independent Media Center in downtown Urbana. The Faire will be held this year on Saturday September 21, from 10am-4pm. Because the Urbana Arts Grant has graciously funded this event, it is free to all member of the community and participating makers. Last year we had 19 makers participate in the event, and over 400 community members were in attendance! 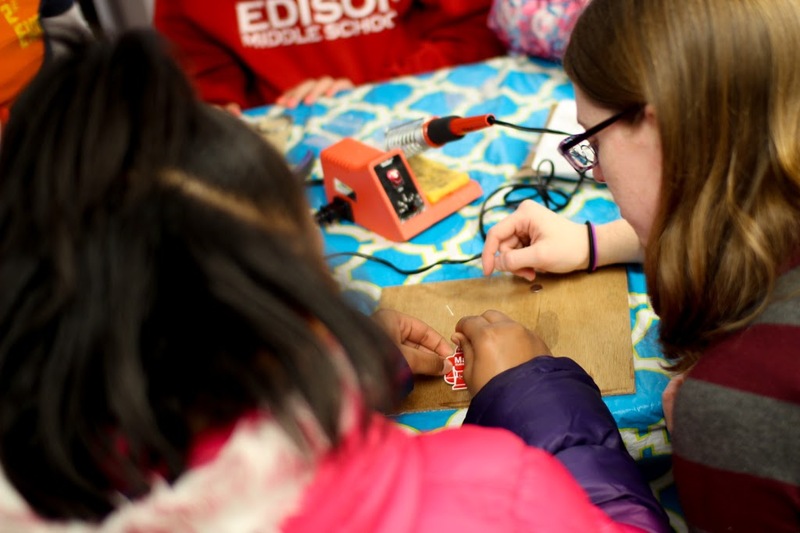 There was a diverse array of makers, including finger knitters, to soldering, a tube player, to (one of our favorite activities) 3D printing. 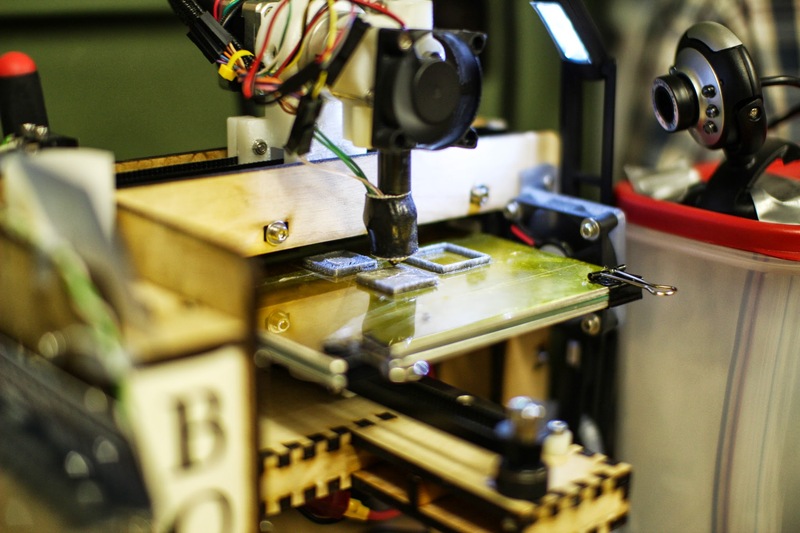 The Urbana-Champaign Mini Maker Faire takes after its enormous parent event, Maker Faire, which hosts 90,000 visitors in San Mateo, California every spring. It began back in 2005 by the people behind MAKE and CRAFT magazines. Since then, Mini Maker Faires have started to sprout up around the United States, including events in in Austin, Detroit, and New York City. 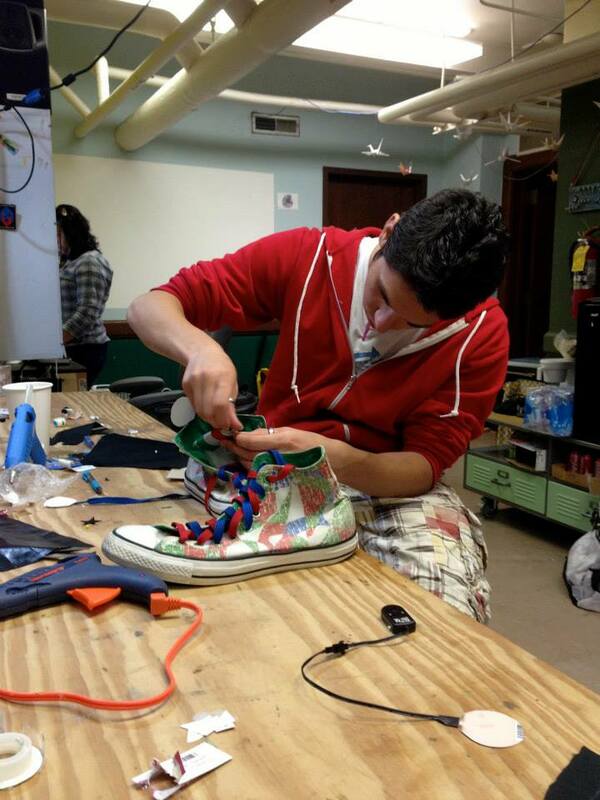 The Urbana-Champaign Mini Maker Faire will be a smaller, community-focused event, but will follow the Maker Faire model of celebrating do-it-yourself creativity and tinkering. Featuring both established and emerging local makers, the UCMMF is a family-friendly celebration featuring rockets and robots, DIY science and technology, alternative energy, bicycles, unique hand-made crafts, music, and educational workshops and instillations. We would like to see this the 2013 UCMMF be the biggest and best event yet! But we still need makers… we want ALL THE MAKERS. So if you or someone you know is inspired to inspire others, fill out our Call for Makers form. 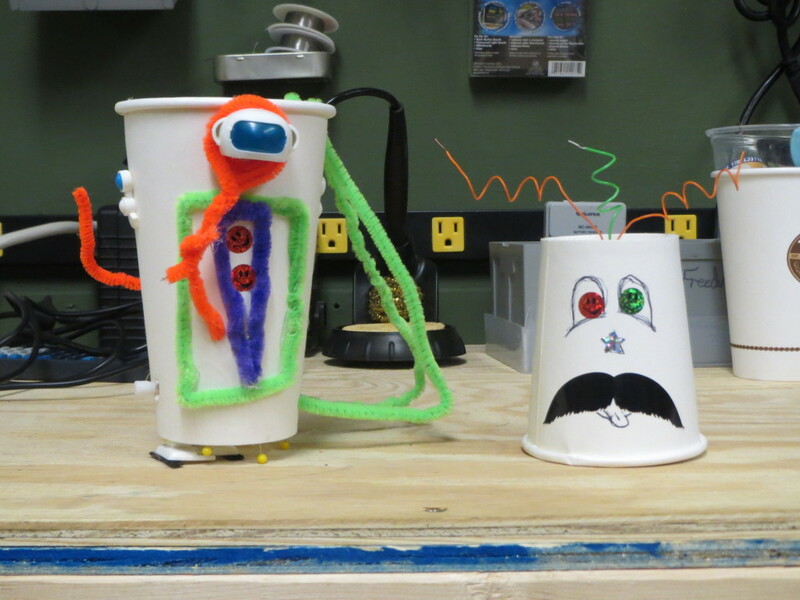 Yesterday ten Makerspace Urbana members made the trip to the Children’s Discovery Museum in Normal, Illinois to host a Maker Disco Tech for their Design It, Create It, Make It camp! And just in case you are wondering, Disco Tech stands for Discovering Technology. Which instead of a dance party is more like a maker party where we set up different maker learning stations hosted by our Makerspace members that the kids could wander between. 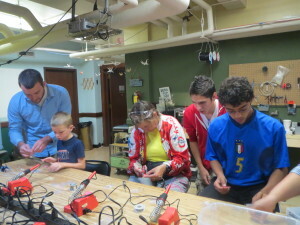 Barry, Emily, Brian, Colten, and Jeff worked one-on-one with each child to teach them the tricks and safety tips of working with the soldering iron. Above we have a maker summer camp kid showing off that fashionable blinkie badge that she made! 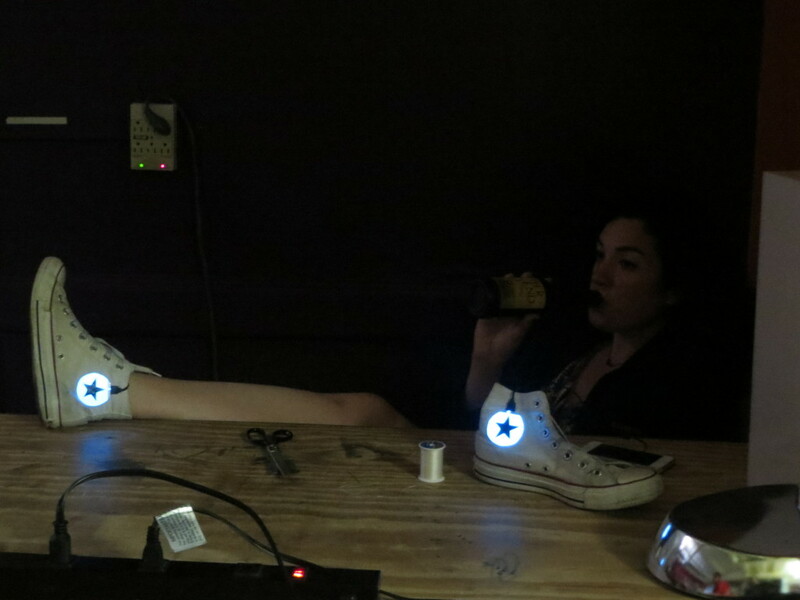 Did you know that you can make a speaker just using some paper, magnets, magnet wire, and hot glue? And that anyone can do it? We certainly didn’t until Jeff attended the Allied Media Conference just last month and brought back this awesome workshop idea (Thanks to Jeff Sturges from the Mt.Elliott Makerspace). 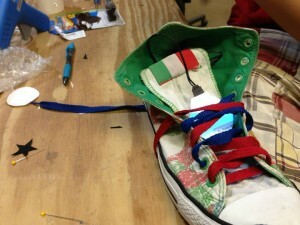 We had a blast with the kids making these and testing out each one to make sure they worked. And a few of these creations ended up on the metallic ceiling vent! (Some of us may have been enablers of this “extracurricular” activity). 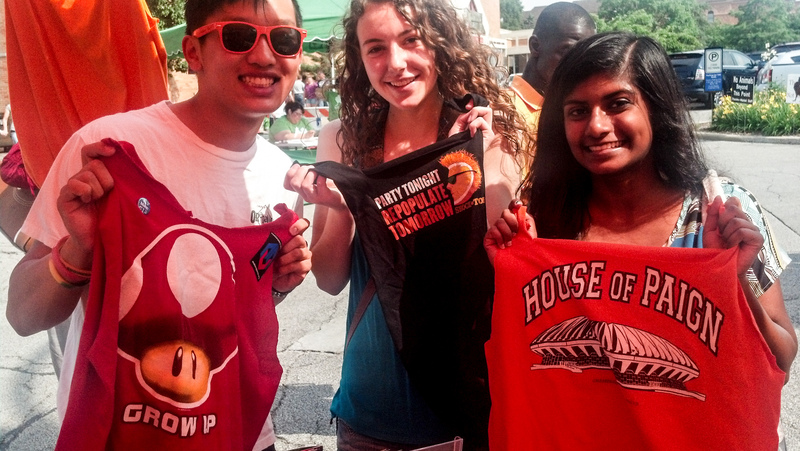 When I asked some of the Children which workshop they enjoyed the most, a few responded with the t-shirt bag project. We are teaching a whole new generation of kids how to upcyle starting with this project, with which just a few snips and knots turns old unwanted t-shirts into bags the kids could take their creations home in! 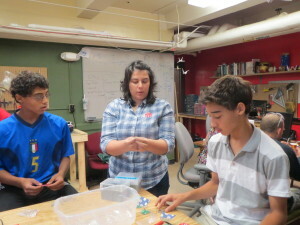 Special thanks to Children’s Discovery Museum Education Coordinator Bethany Thomas for reaching out to Makerspace Urbana, and making this happen! And especially thanks to the 19 kids who made this event a memorable one for all of us. 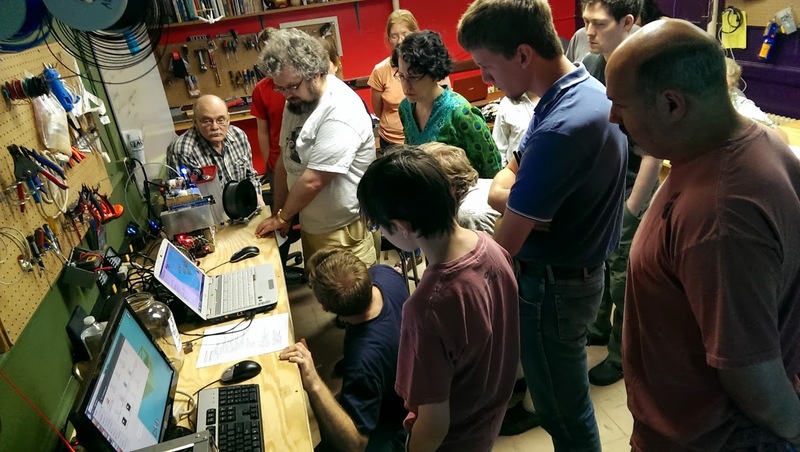 Our first ever Summer Make-a-tion 3D printing work happened last weekend and we had a wonderful turnout. 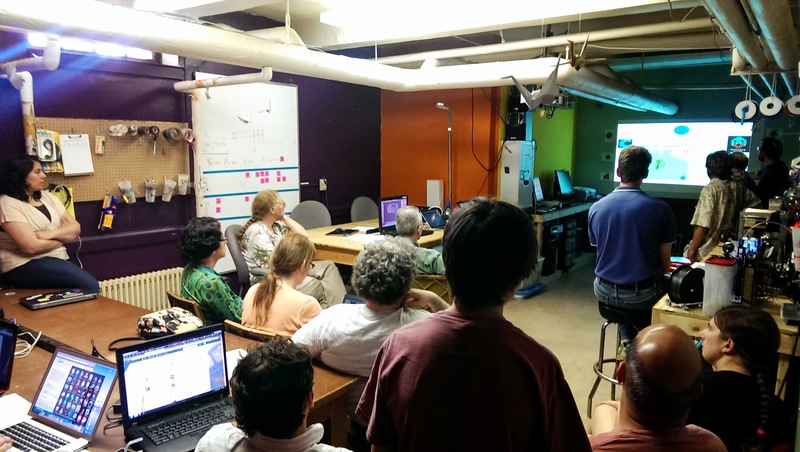 James and Brian put together a workshop aimed at introducing people of any and all skill levels to our 3D printer. 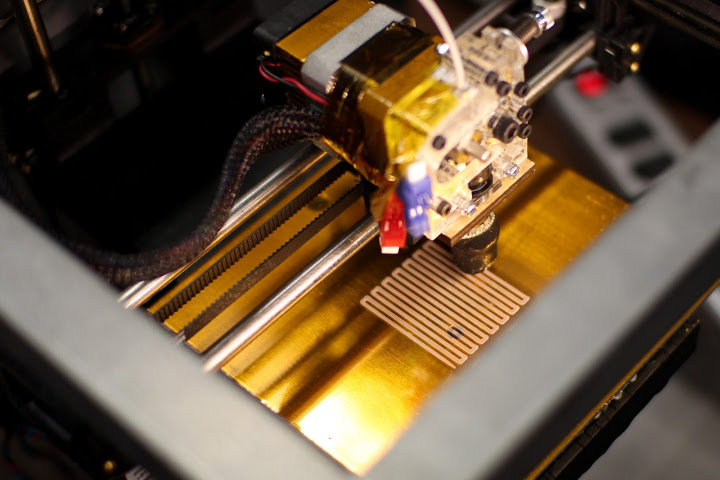 With no previous knowledge required all participants were able to find 3D models to print online and personally customize them using free and easy to use online resources. 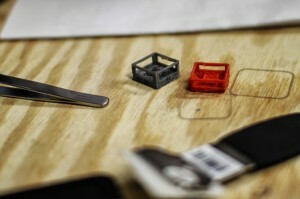 After every group had customized and generated their 3D part we loaded them all up into the 3D printing software and printed them all together in one run. 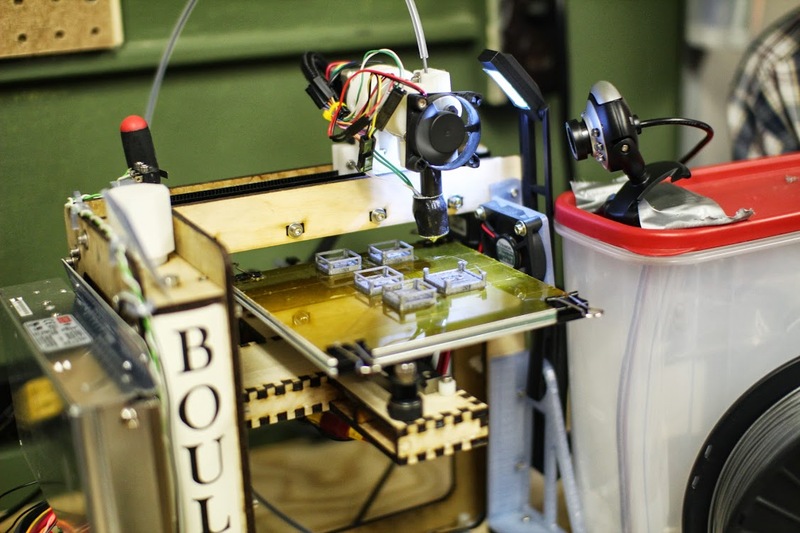 The Maker Space Urbana Solidoodle 3D printer is free to use and available for people whenever the space is open (check the calendar or join our facebook group for times). Plastic and maintenance for the printer are payed for by a donation jar sitting next to the printer so please contribute if you are able. More photos from the event here. Summer Make-a-tion kicked off this year with a field trip to The Living Letter Press, one of our favorite local maker friendly resources. 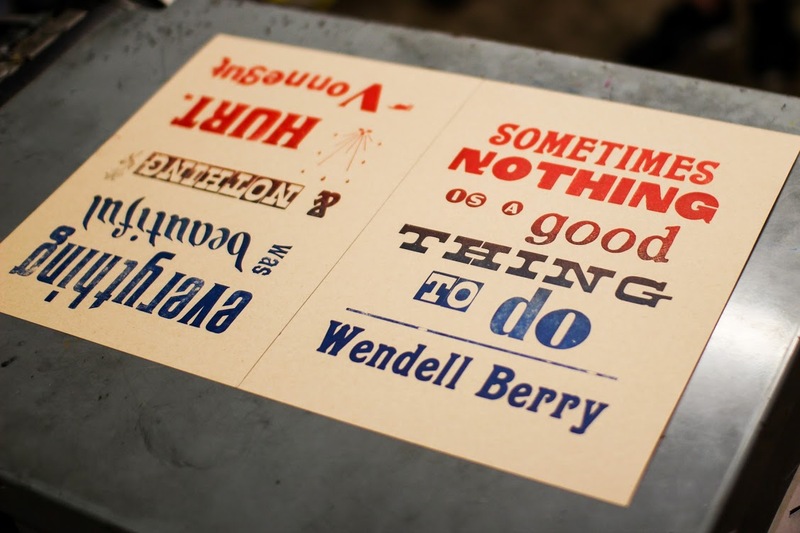 In this workshop we hand set original wood type and created two different one of a kind posters based on famous quotes that we picked out as a group. 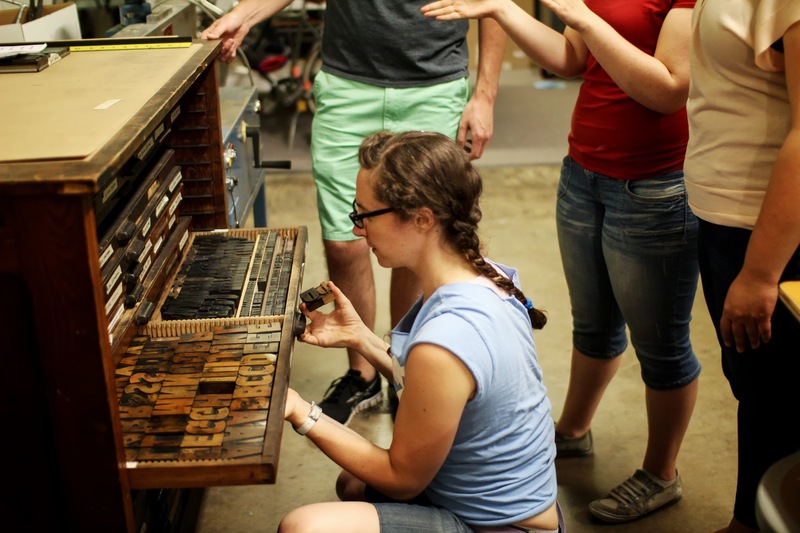 We all got to browse through their enormous cases of type to pick out the exact letters we wanted for every word. 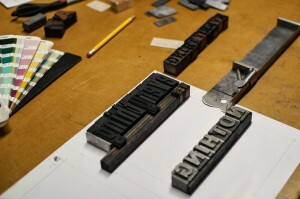 We searched through both their upper cases and their lower cases of type. Yes, that’s where those terms come from – how neat is that! 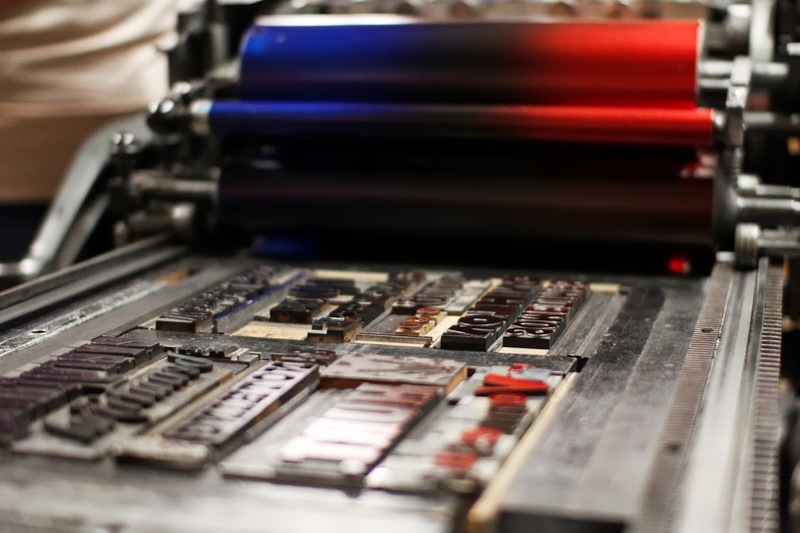 In fact many of the terms used in modern word processing programs have their origins in the physical workings of letterpress shops. 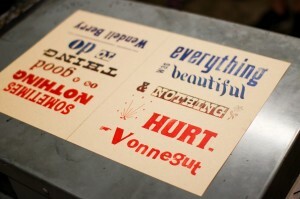 Visit the Living Letter Press and you’ll be sure to learn more examples. 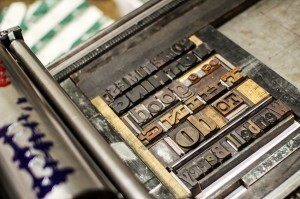 After the type was set we moved it to an an original Vandercook Proof Press. 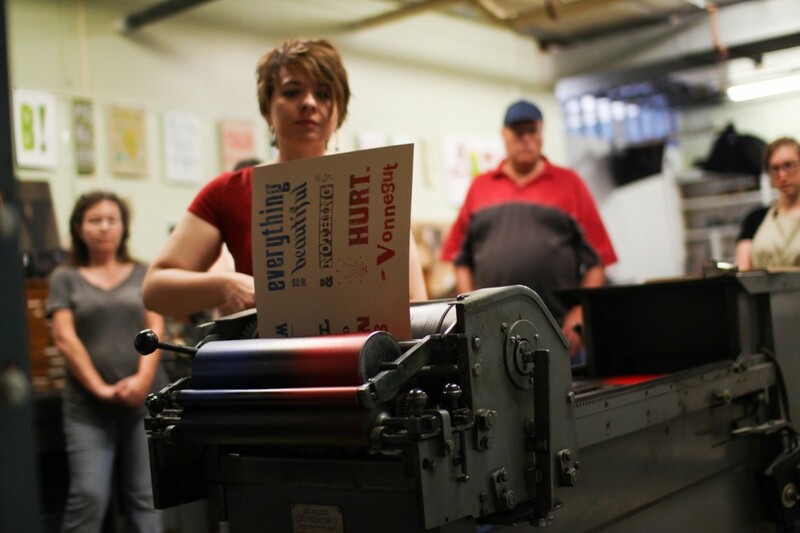 We inked the press with red and blue ink so that they would merge together and print a red/purple/blue pattern. Then it was time to print! We all hand cranked out our own posters and ened up with some pretty beautiful results. Huge thanks to Molly for hosting us and being a wonderful instructor. 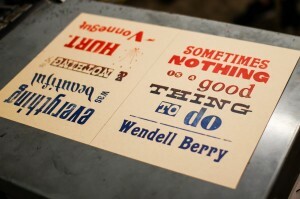 Find out more about the The Living Letter Press at www.livingletterpress.com. 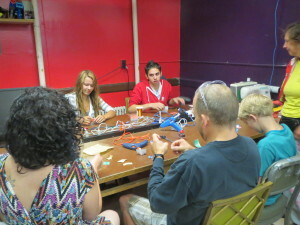 Check out our up coming Summer Make-a-tion workshops here! It’s time for our third annual Summer Make-a-tion series and the first two workshops are open for sign up. Just click the Make-a-tion tab above. 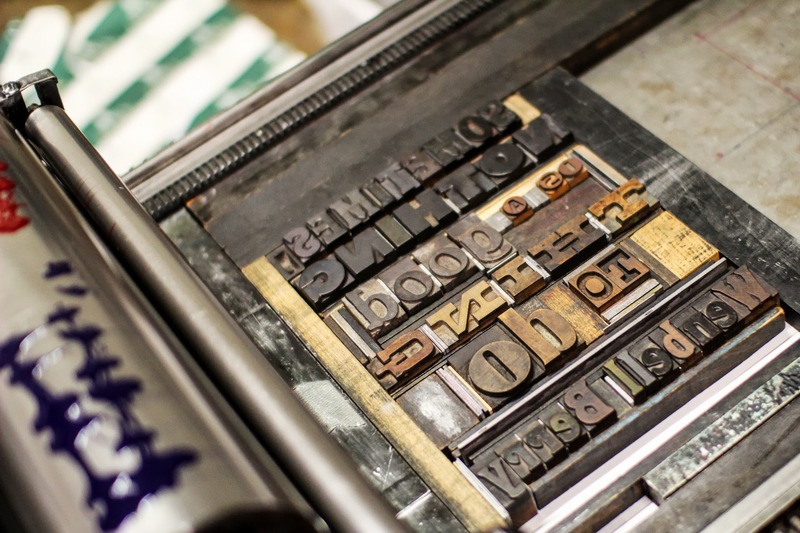 We’ll be visiting the Living Letter Press and holding a 3D printing workshop for all ages. Comments Off on Art at the Market! Expand your collection of re-usable shopping bags by converting an old t-shirt into a tote. No sewing skills required, pick a shirt and we will show you how to make the adjustments. Then, fill it with a harvest of Market goodies! And a huge thanks to the Urbana Public Arts Program for sponsoring this event. Additionally, the attached shortcut list is an invaluable resource while learning Blender. Comments Off on Girls do Science! The wonderful people at the Orpheum Children’s Science Museum approached us recently about doing a workshop for their Girls do Science Club. 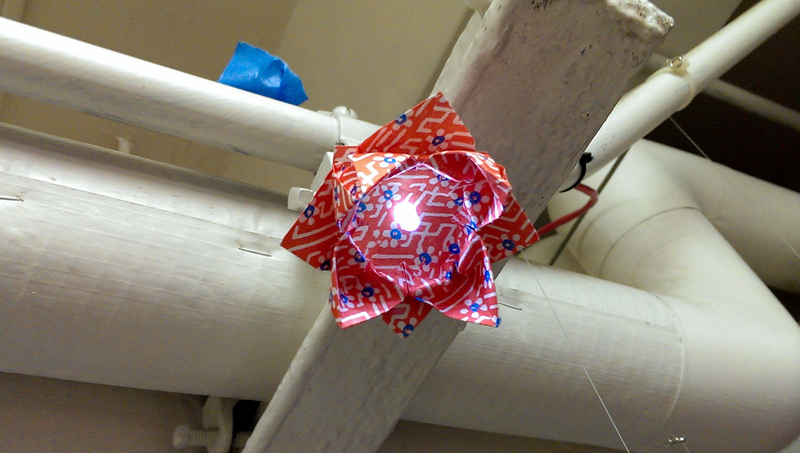 We had about about 20 girls from 2nd grade-6th grade coming by so some of our member came up with the idea of doing a light up origami project with the kids. As you can see it turned out great. 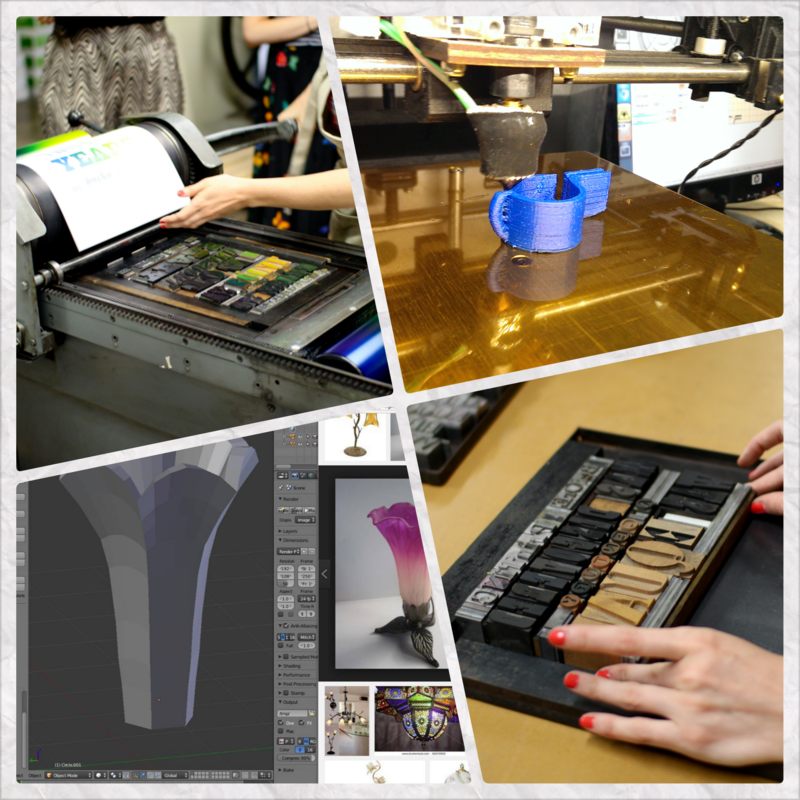 More sessions to follow, providing hands on experience modeling and printing. If you have anything you’d like to see in a future workshop, give us your comments! Lots of stuff happening today! Comments Off on Lots of stuff happening today! Get help with your computer problems! learn how to fix stuff! donations encouraged, or donate your time to help others! 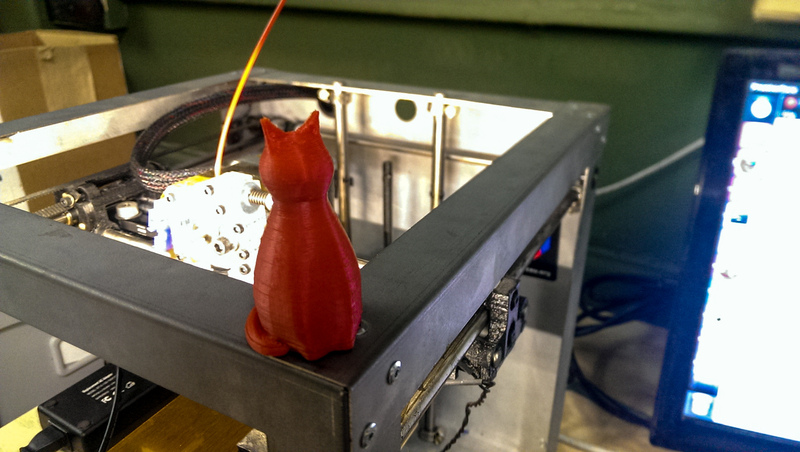 We have a 3-D printer, yo! Learn to design, share, and print on our 3-D Solidoodle printer. Want to hear a bunch of things that we’re doing, have done & plan to do? Interested in learning how you can get involved? Maybe form a partnership with us on an awesome project you’re working on? Our Monthly Membership Meeting is the place to connect. We’re located in the basement room #16 of the Independent Media Center in Urbana. The space can be a little tricky to find but if you enter through the back (south) bike project door (near the radio tower) and take your first left, we’re at the end of the hall. This map should get you there. Comments Off on Girls Geek Out! 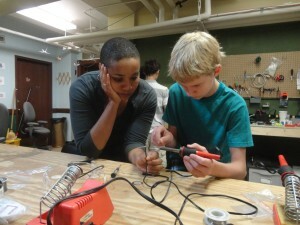 Women’s Resources Center just held a wonderful event as part of Black Geek Week and were lucky enough to be able to set up a ‘learn to solder’ work station and be part of it. With the Holidays right around the corner, forget about commercially produced junk and come make a keepsake ornament of your very own. 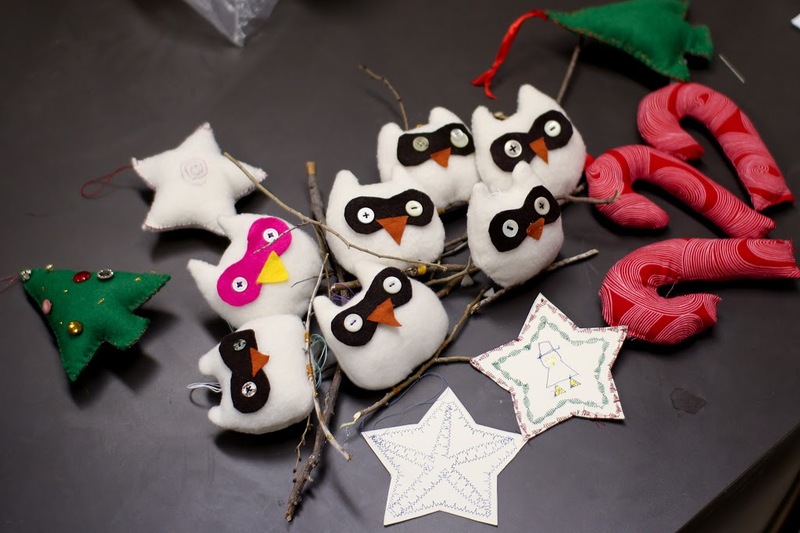 In this workshop we’ll be focusing on sewn ornament design and construction and the sewing skills that go with it. All ages and skill levels are welcome. No need to bring anything but your love of making. Ornament options from easy to advanced. Sign up online here or on facebook. Drop-ins welcome. Just joining the facebook eventwon’t guarantee you a space. In this workshop you will learn the basics of glass fusing and slumping and how to cut glass and piece it together. We’ll all create a blue fused glass ornament/tchotchke with snowflakes and then design our own unique creations. No need to bring anything but your love of making.$10 suggested donation. Comments Off on The Solidoodle is printing! We got out new Solidoodle 3D printer up and printing. We hope to make a permanent place in the space for it and have it available for any members to use(after training). So come on by and play with it some time! Solidoodle is go. First thing it did…. play tetris. Comments Off on Solidoodle is go. First thing it did…. play tetris. The Solidoodle is here and next Wednesday (Nov. 7) 7pm we’ll be having our first Training/Learning/Planning session with it so stop by if you’re interested. Not done with your halloween costume? How unseamly! 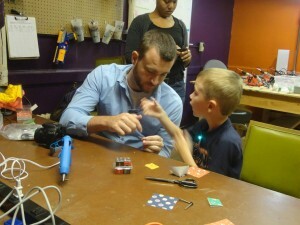 But don’t fret as Shared Threads and Makerspace Urbana have teamed up to help you. 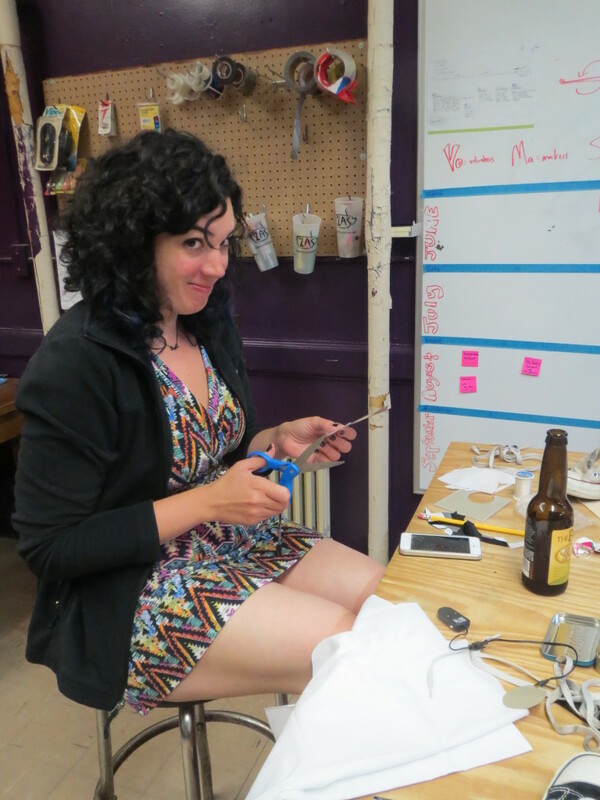 We’ll be holding a series of sewing-oriented open hours in the weeks leading up to Halloween. 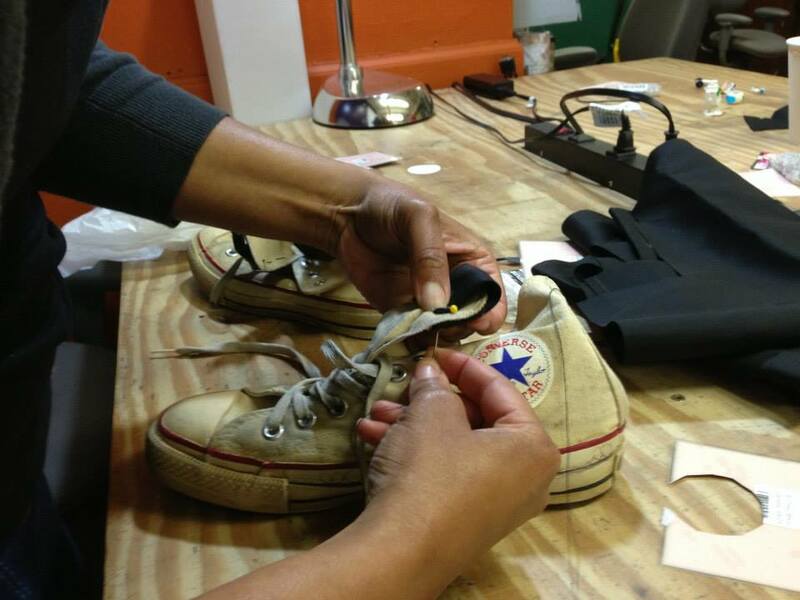 If you enjoy making your own costume, come work with others, get help, and share skills. We provide: a room full of sewing machines and the expertise of an experienced tailor. Plus all the shiny LEDs you can get your hands on. You provide: Your materials and a love of making. And if you’re still thinking to yourself: To sew or not to sew? You don’t have a choice buddy because Halloween is 3 weeks away! 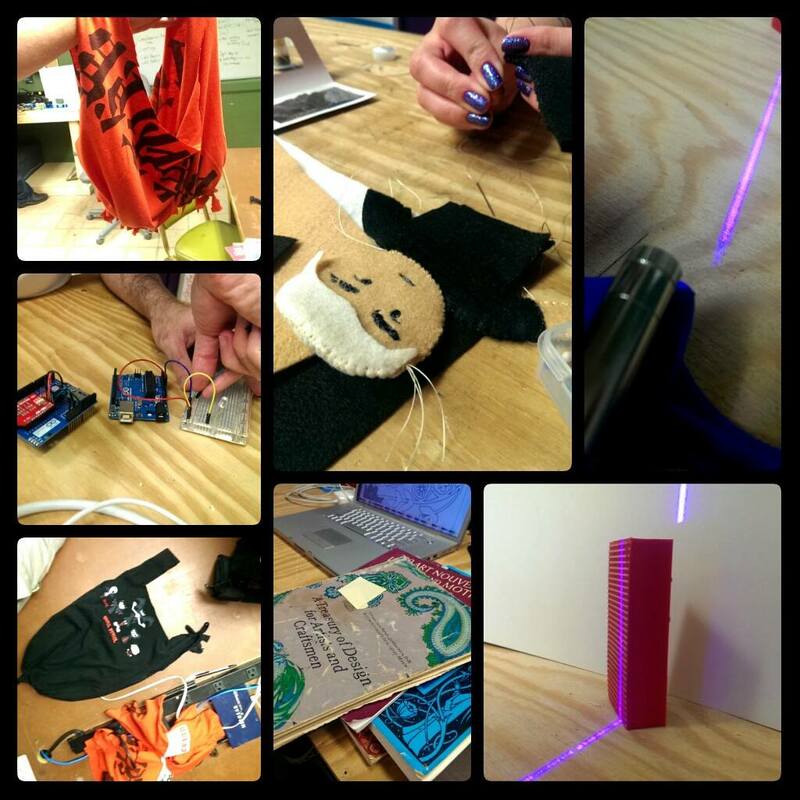 So stop hemming and hawing and come by the Makerspace: Basement room #16 at the IMC. End of Summer Make-a-tion Party (and Movie Night)! Comments Off on End of Summer Make-a-tion Party (and Movie Night)! We met a lot of amazing people over the summer. Words cannot express our gratitude to everyone who came to support us, including all of our awesome instructors. And where words fail, pizza saves the day! I hope all of you will join us in celebrating the close of another excellent make-a-tion with some food, drinks, and a merry good time. This will be followed by a movie night. The movie is TBD right now, but keep an eye out. Last day of Summer Makation is here. Comments Off on Last day of Summer Makation is here. workshops happening. 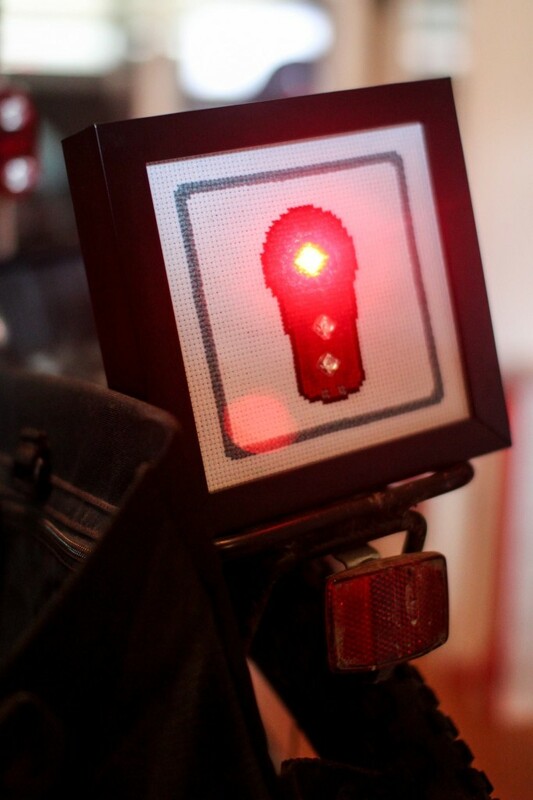 Arduino Robotics and Sewing Switchcraft, both aimed at artists, tinkerers, makers and people who just like to create. Join us! Summer Make-ation 2012 is here. Comments Off on Summer Make-ation 2012 is here. Check out the Make-ation page for all the info. Whew! What a day! 431 people came to the faire today. Stay tuned for photos and information about next year. Comments Off on Whew! What a day! 431 people came to the faire today. Stay tuned for photos and information about next year. Also make sure you engage with the groups you found most interesting. If one of those happens to Makerspace Urbana you’ve come to the right place. 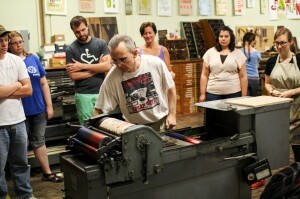 We have open hours every Wed at 7pm and are always looking for new makers. Get your waffles at the Crave Truck on the south side of the IMC!! Comments Off on Get your waffles at the Crave Truck on the south side of the IMC!! Things are hopping at Maker Faire! Come in out of the rain and make something cool! Comments Off on Things are hopping at Maker Faire! 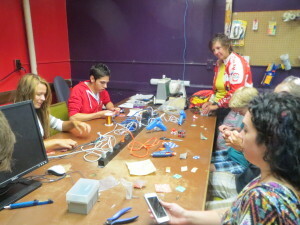 Come in out of the rain and make something cool! Booths are set up! Crave truck is here! First attendees are in the house. Come one, come all, Maker Faire is open! Comments Off on Booths are set up! Crave truck is here! First attendees are in the house. Come one, come all, Maker Faire is open! Maker Faire is here! Don’t let the grey skies get you down, we’ve got lots of kinetic energy and indoor activities for kids of all ages. 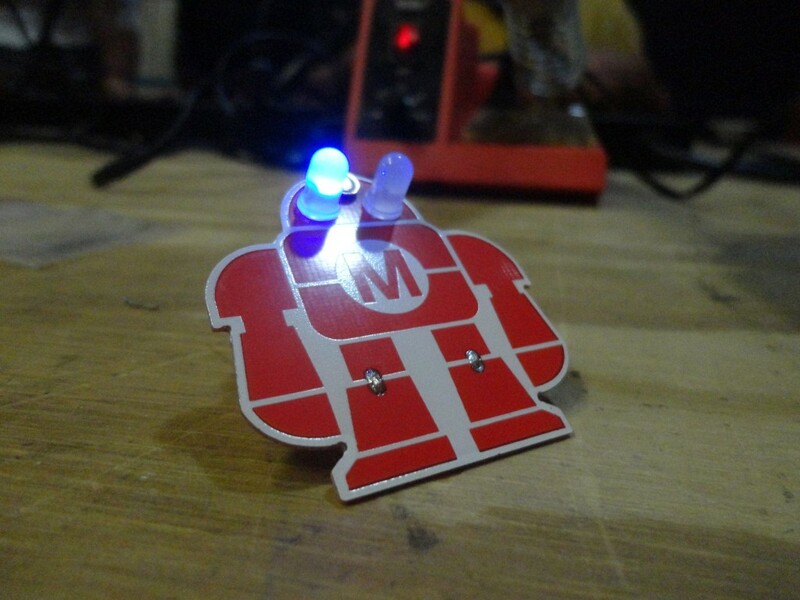 Comments Off on Maker Faire is here! Don’t let the grey skies get you down, we’ve got lots of kinetic energy and indoor activities for kids of all ages. Just got word that the Crave Truck will be at the Maker Faire at 10am on Saturday, ready to serve you waffles and hot coffee! Yum, yum, yum! Comments Off on Just got word that the Crave Truck will be at the Maker Faire at 10am on Saturday, ready to serve you waffles and hot coffee! Yum, yum, yum! Looking for a student photographer to take pictures at Urbana-Champaign Mini Maker Faire on Saturday, April14. Job pays $100 honorarium. Send me a message if you are interested or spread the word if you know someone who might be interested. Comments Off on Looking for a student photographer to take pictures at Urbana-Champaign Mini Maker Faire on Saturday, April14. Job pays $100 honorarium. Send me a message if you are interested or spread the word if you know someone who might be interested. *There are no general open hours on the 2nd Saturday of the month. Please note that Makerspace is located in the basement and is only accessible by stairs. Check the calendar for changes and special events. We are a 501(c)3 non profit charity and we rely on generous donations from members, visitors, and supporters to keep our space and resources open and free for public use. 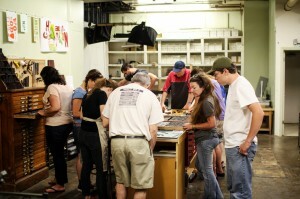 Donations also make our many public workshops and events possible. 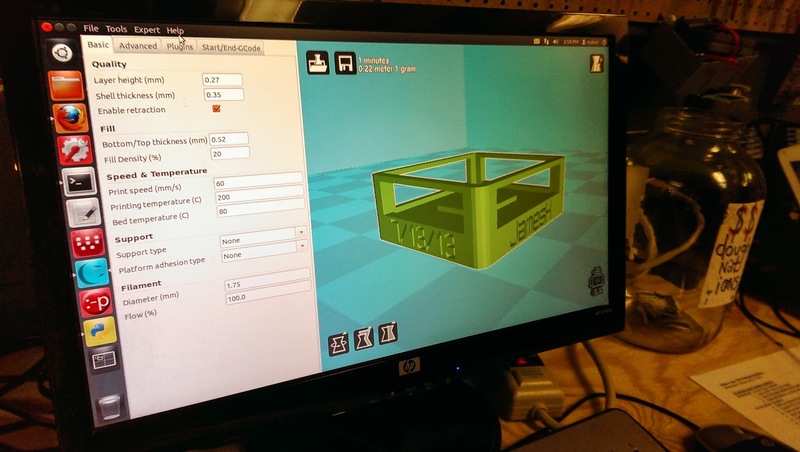 Join our Google Group to receive Makerspace emails!